DV-Mark MULTIAMP. A simulator or emulator that might change your idea of how easy these amplifiers can be to use. There is no doubt about the prevalence of amplifier simulators, emulators and even profilers coming on to the market; some would argue that it's about time and for good reason. But are there too many bad or overpriced units available? And do they really come up to sounding like a real tube amp? And don't forget those dynamics and feel that are so important to how an amp plays. Tube amplifiers have been around for a long time; they are typically a little fragile, temperamental, usually very heavy and can cost a fortune for the pro models available. Of course there are the 'cheaper' Chinese products, but often all they really contribute is a lower price with often guaranteed lower quality or simply bad design. And I'm sure that over time that the emulator or simulator market will undoubtedly become far more crowded as we move forward. But most (if not all) of these type of products suffer in one way or another because the guitarist has to be an aircraft pilot to make it work or even some mad scientist programmer (as some of the designers are); to say that most are hard to navigate (and some awful to setup even one tone of your own) is really one of the main problematic issues of these kind of products. What do I compare the DV-Mark Multiamp to? Now let's get one thing straight from the start of this review - the Multiamp is NOT a Kemper style of product, but far more like an Axe-FX (if someone was to make a comparison); Kemper amplifiers use a solution of making a 'profile' of another amplifiers sound, while the Axe-FX style of product typically simulates or emulates a tone, but more recently can't decide what it wants to be. The MULTIAMP from DV-Mark fits nicely in the emulator/simulator park so is most likely to be compared against the Axe-FX products. So for simplicity, while there are other simulators and emulators on the market, I'll just refer to those as the Axe-FX style of product throughout the review. I went to the Music Messe in Frankfurt on a day off working in Germany because it happened to be on at that time while I was there. As usual, all the top names of equipment were there, Marshall, Fender, Gibson, Mesa and so on - we all know them. I had previously bought a DV-Mark Triple 6 amplifier just the week before my business trip and was reasonably well versed about DV-Bass (basically the same company as DV-Mark) by my friendly Bass player (is there such a thing?) so when I came across the DV-Mark stand I hopped over to see what was new. 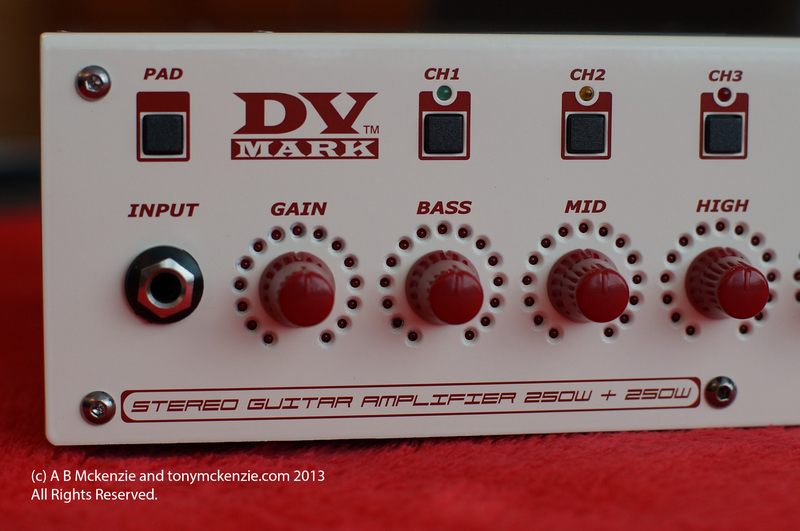 Actually, I already knew about the DV-Mark Multiamp and wanted to see it in the 'flesh' so to speak. So I got a demonstration from a guy on the stand name Roberto De Virgilio (a very nice guy) and he took me step by step through the demo and made some nice noises to accompany the demo; all exciting stuff indeed. I also saw on the stand a quick flash by of Fabrizio 'Bicio' Leo who some of you might know as a very accomplished guitarist who is seen often playing the Multiamp both at clinics and live. Lastly I wanted to find out how to buy a unit so I spoke with Riccardo on the stand and he pointed me in the right direction. It was rather a surprise to find out the price of the unit, and while it does vary somewhat on the street a typical price is probably around £12-1300 pounds in the UK. The Multiamp is likely to be the lowest cost quality product in the market of its type that also includes as standard a 500w amp (or 2 x 250w stereo) in the price! So I bought one and also two C 1x12 Cabs (more on those later) in a very nice cream colour. Wow! You know, in the early days Italy was not particularly known as a high tech place for QUALITY (unless you drive a Ferrari). But just looking at this Multiamp before I even took off the lid to peek inside I could tell that there was quality... its all around; from the anodized top, the knobs, the (what appears to be) enamelled front, the I/O etc. you could just feel the difference between this unit and some costing twice the price. Once the lid is off the quality build inside is quite honestly breath-taking and I have never seen a nicer or more tidy build than was inside this DV-Mark Multiamp. It really put units like the Eleven Rack to shame (not to mention those Axe-FX type of units with elements of low quality welding). Fortunately on the Multiamp they did not have any 'very low quality' welding and other stuff like that in the chassis build. The overall layout was a credit to this company and I have no hesitation in recommending this product regarding the quality of the build and the chassis assembly; it was near enough perfect. 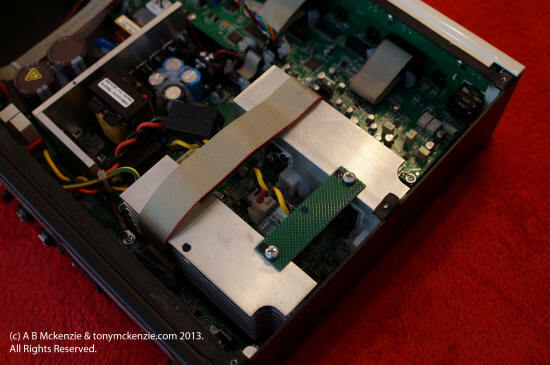 Examine the image above (where the blue line is) and you can see just how large the power supply is. And you can see exactly how its put together - and that matters greatly where high quality power is required. I have seen other units (think Eleven Rack and FX Styles) with power supplies that were potentially low cost bottom end Chinese stuff that could cost just $10-$15 from Chinese production and I can tell you that here in the Multiamp there is no comparison whatsoever. This is a class act. You can see the smoothing caps, the regulators to get that voltage very nice without noise and lots of other components to give a really great power supply (the output) to the amp, both in the 'preamp' (we'll call it that) and in the 500 Watt Power Amp. What else is inside the Multiamp? The Fan: This is nice and quiet so it should not really pose any issue in a studio environment - just what the doctor ordered. Little things like noise are often forgotten by some manufacturers and it shows that DV-Mark have considered most angles and included it in design where necessary. The Power Amplifier: Yikes this is one hell of an amp built right in to the Multiamp and included in the price. You see two MASSIVE aluminium heat shields to dissipate the heat when this amp is on full whack giving out that massive 500 Watts (or 250/250 Watts in stereo). Take a look closer. Main Processing Board: The main board, like everything else inside the Multiamp is first class quality. When I checked out the chips that are used they tend to be the rather better stuff out there, but unlike the Axe-fx style of product the Multiamp does not use or need excessive processing to get things done; and extra processing means extra cost, although not as much as some would have you believe. I guess simpler firmware means simpler operation by the user and then there's no need for multiple processors like in some units. 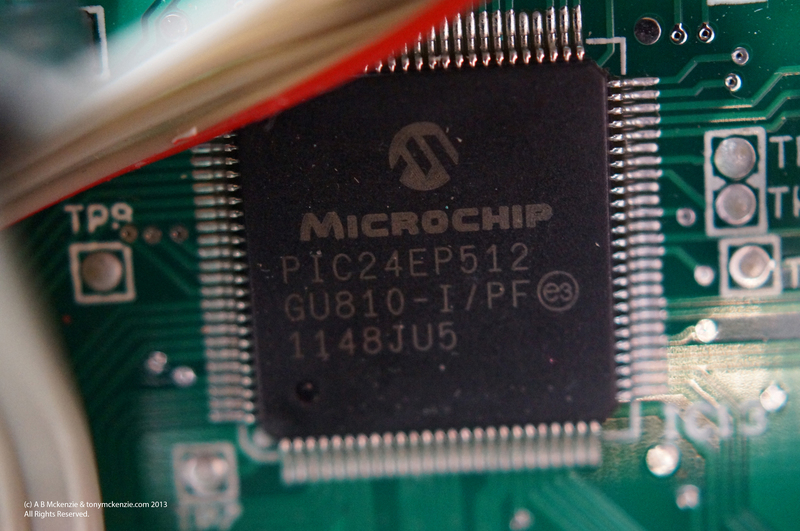 Microchip’s PIC24E general purpose microcontroller family features the highest speed 70 MIPS core with excellent performance and code density. It offers superior ADC performance, enhanced CAN communication, easier graphic display interface through 8-bit parallel master port and up to 15 DMA channels for extensive data movement. These devices are available in various packages and with extended (125°C) temp option which means you won't get heating issues! This chip I believe is handling the controls of the amp, the SD card, the Midi, The graphic display, the 'channels' and the 24C02 Eeprom on board the Multiamp; it might do more but I have no real other information. SHARC Processor & the Digital Application Interface: The SHARC ADSP-21489 is one of two new members of the fourth generation of SHARC® Processors and offers increased performance, hardware-based filter accelerators, audio and application-focused peripherals, and new memory configurations capable of supporting the latest surround-sound decoder algorithms. All devices are pin-compatible with each other and completely code-compatible with all prior SHARC Processors. These newest members of the fourth generation SHARC Processor family are based on a single-instruction, multiple-data (SIMD) core, which supports both 32-bit fixed-point and 32-/40-bit floating-point arithmetic formats making them particularly suitable for high-performance audio applications. The ADSP-21489 offers the highest performance – 450 MHz / 2700 MFLOPs – in an LQFP package within the fourth generation SHARC Processor family. This level of performance makes the ADSP-21489 particularly well suited to address the automotive audio and industrial control segments. In addition to its high core performance, the ADSP-21489 includes additional processing blocks such as FIR, IIR, and FFT accelerators to increase the total performance of the system. There is a new feature called Variable Instruction Set Architecture (VISA) that allows the code size to be decreased by 20% to 30% and increase the memory size availability. 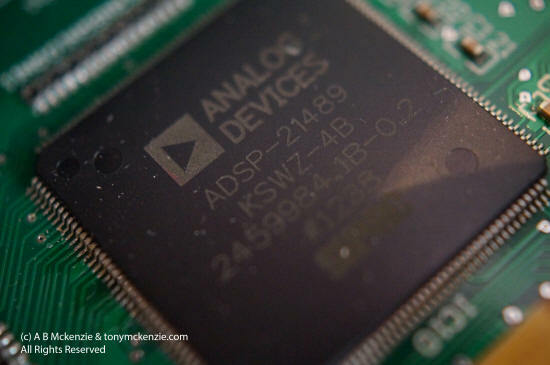 The fourth generation DSP allows the ability to connect to external memory by providing a glue less interface to 16-bit wide SDR SDRAMs. Basically if you have an ADSP-21489 Processor on board things will rock! 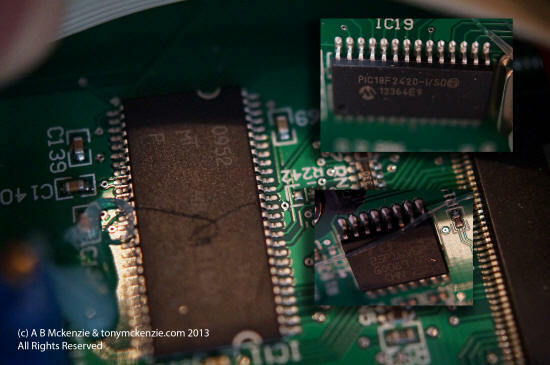 This one communicates on board to the SPI Flash and SD Ram. Other Components: 16Mb Serial Flash Memory and Enhanced Flash Microcontrollers with 10-Bit A/D and Nano Watt Technology are also on board as well as other industry standard components. 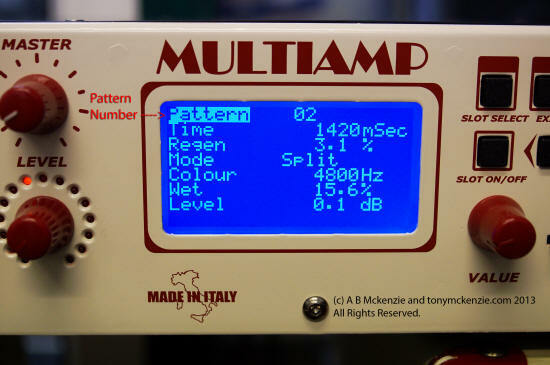 You could say that the Multiamp uses tried and trusted micro processors (indeed similar to many other units) and other components and adds them to a fantastically manufactured amplifier. There are also display screens and much more to the Multiamp - but what did you expect? The Multiamp is not an old design and DV-Mark I am sure would use current technology to make their Multiamp a contender for the best out there. External I/O: The external I/O is neatly located on a few boards that are not integral to the main board. This is a really great feature because if for some reason the I/O got damaged then you would simply replace the cheaper board rather than the main processing board. And its a similar story on the display board at the front of the amp, as well as those front controls that you see at the front of the amp. Nice and easy to fix should you get a problem, although with build quality like this it's going to be unlikely that there would be any manufacturing defects. 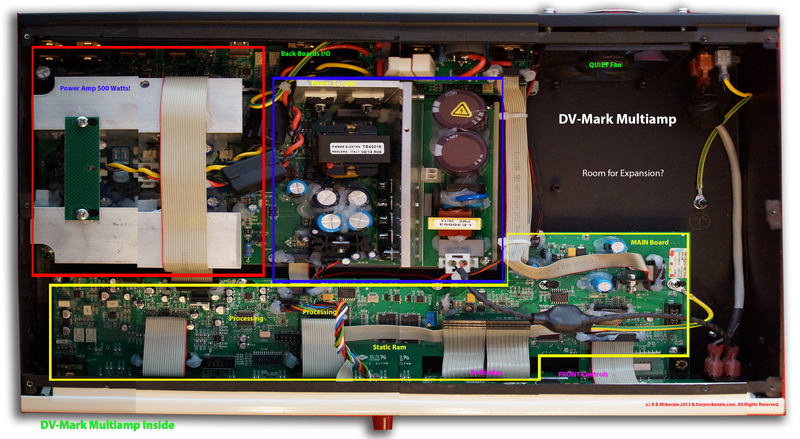 This concludes the section about the inside of the DV-Mark Multiamp and you could say that I am impressed. Having looked at loads of digital gear since the end of the 70's right through to today in my career I can confirm that the Multiamp is one of the nicest builds I have seen in some time. Channels available on the Multiamp! Strangely enough (for one of these styles of amplifiers e.g. a simulator/emulator product) the DV-Mark Multiamp actually has channels... at least that's what Ill call them. The idea of having a number of distinct channels (like on a real tube amp) is very strange for this type of kit, but in reality that's one of the Multiamp's greatest features; basically a clean, crunch and lead channel right there on the front panel. I just love this feature; and you will too, just imagine using gear like this that's easy to use! what a great idea - it's a pity that many other companies simply don't do things this way; you know... simply. If you press ch1 (channel 1) you can choose from a number of amps suited to clean for example. Those amps change if you use a different channel i.e. channel 2 will provide 'crunch' amps and channel 3 gives us lead tones and I have to say it works quite well. Just a point - choosing a 'clean' amp does not mean you can't drive it on channel 1; of course you can adjust all of that in a pre-set and save it as a new user one. Of course it's likely over time that the number of amps available will increase dramatically - although to be honest it can also be blessing to have just enough to use all of which are first rate; as in the case of the Multiamp. 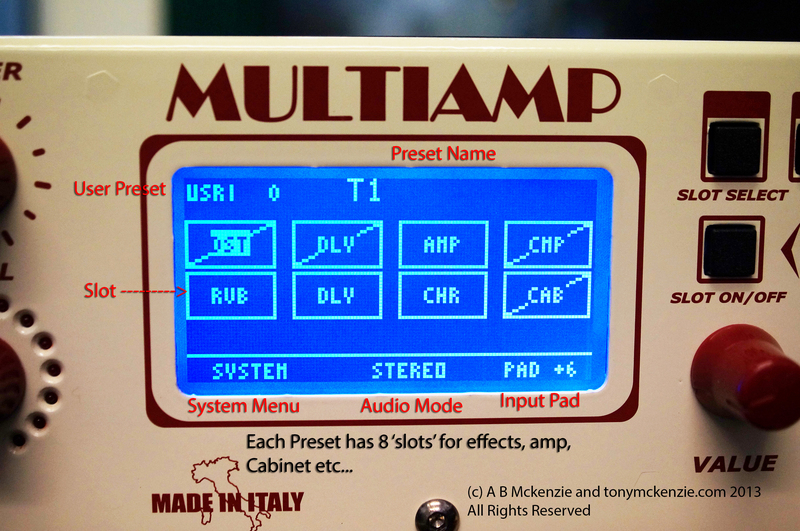 The Multiamp Pre-set Screen Explained... it's easy! Here's the relevant info for that screen above and you will find that its 'easy peasey' to use within about 5 minutes! The 'Slot': Now looking at the above screen you can see 8 oblongs... each one of those is a slot and you have eight in any pre-set. You can put in those slots anything you want, for example on the screen above top row is: DST (Distortion), DLY (Delay), AMP (Amplifier), CMP (Compressor); and on the bottom row: RVB (Reverb), DLY again, CHR (Chorus) and lastly CAB (Cabinet). If there is a diagonal line (as there is in some slots above) then that slot is turned off. System Menu: From here we can save a file, choose the amp mode, setup MIDI or update the firmware; here is where we also load those purchased amps and cabs licenses - more on all of that later. Audio Mode: This shows that the amp is currently setup for stereo mode and at 4 ohms we get 250/250 Watts out (8 ohms is 150/150 Watts); note that the Multiamp can determine the load as it is 'intelligent' for speaker loads between 4 ohms and 16 ohms. Input Pad: The input pad can be set to reduce the input from the instrument, but it can also be set to increase the gain too - I had this set to +6db which drove the amp very nicely indeed. Like I said earlier - this really is not rocket science. There are a number of patterns for the delay and the above screen denotes pattern 2. All the other usual stuff is in there and with just a few seconds of adjustments you will have the Delay as you want it for this particular pre-set. I won't bore you with more of this as its basically similar from anywhere in the slot block. From the file menu we can store or recall from the SD memory card, Export or Import a pre-set or delete a pre-set. It's all obvious stuff - even for guitarists that don't have much technical ability unlike some equipment that is just way too complex and becomes a turn off for most musicians. 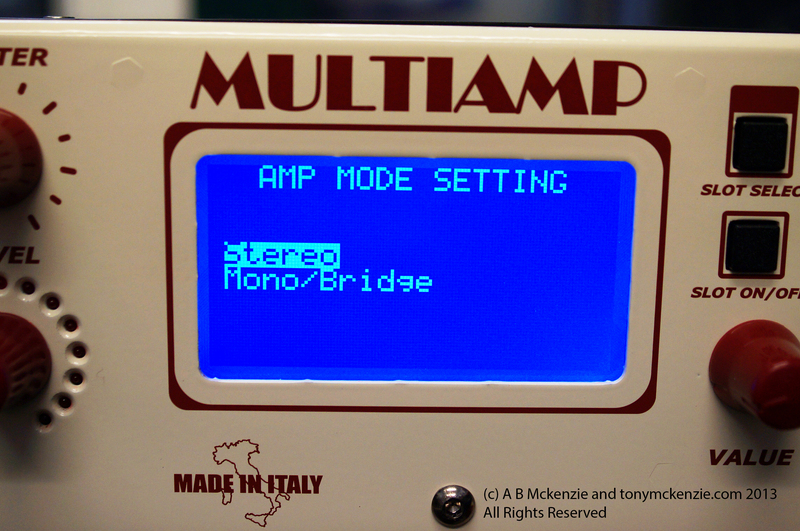 This is a great feature of the Multiamp; just come to the amp mode menu under the settings menu and change the amp from stereo to mono or bridged. The amp can give out a whopping 500 Watts in bridged mode. It's unlikely that you will need more power... ever! Also under the system menu is the MIDI setup and update of Firmware as well as where we load licenses for bought amps and cabs - all pretty simple and DV Mark give you full instructions on their website of how to do that exactly. Make sure you get the correct SD Card! 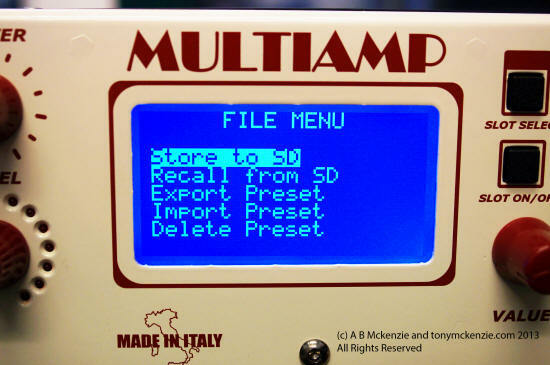 One thing that caught me out somewhat when I first got the Multiamp was the SD card. Typically today most SD cards are of the SD HD standard. I formatted a 16gb card in my PC as FAT 32 (which is a requirement), copied on the firmware upgrade, put it in to the slot and tried to upgrade and whoops... nothing. At least there was nothing on the SD card the system reported; that was untrue because I just copied the upgrade to the SDHD card. I believe the slot only supports SD cards (which typically these days are 2gb; you just might find larger ones) but I was using a 16gb SDHD card... it did not work for me and it won't work for you either! I don't think it was a size issue and once I used an SD card it all worked perfectly. There may be an update at some stage; at the time of writing the review I had no further information available and have asked DV-Mark about the SD card and it's standards. Mains Power: Firstly, don't bother trying to buy a Multiamp and changing the voltage to other countries! You might just do it but I think not. DV-Mark are extremely specific when it comes down to which Multiamp's (and other DV-Mark kit) go to which country with the corresponding voltage. They say in the manual 'DV Mark amps/combos are manufactured to be sold and used in the country of purchase, and they are factory pre-set to a country's voltage. Due to homologation issues, the voltage may not be changed'. So now you know; if you want a 250 volt unit buy it where that country uses 250 volt mains! There is also a mains fuse in the power connector of the amp for safety reasons. Always use the recommended fuse. 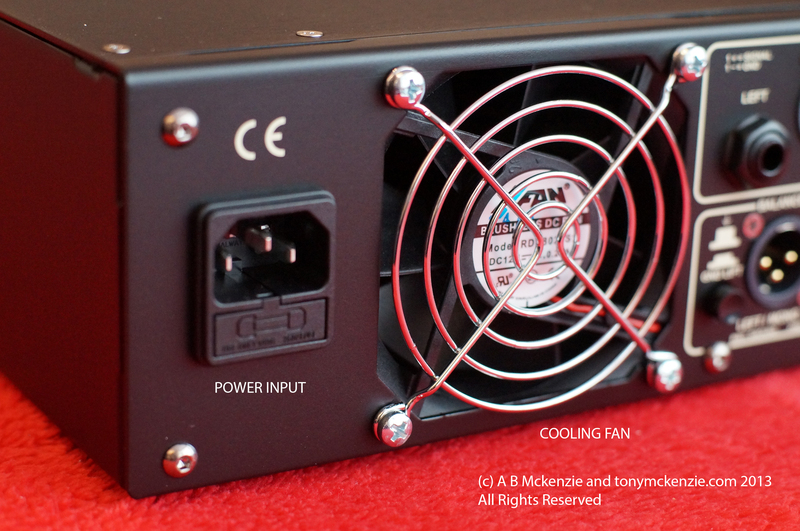 Cooling Fan: There's not much to say about the cooling fan except that it is very quiet. On a number of occasions I had to check for a 'breeze' to ensure it was working. This makes for a really quiet fan in the studio. Nice. Speaker Outputs: The amplifier is an 'intelligent' amplifier and really can work with speaker loads of 4 ohms and above but ensure that a minimum of 4 ohms exists as a load and no more than 16 ohms. In stereo operation using the left and right outputs with 4 ohms generates 250/250 Watts out and with 8 ohms output reduces to just 150/150 Watts. Probably more than you will need. I used two C 1x12 cabs finished in cream rated at 175 watts so those work well as does the 4 x 12 cab that DV Mark make. The Bridge mode uses a 'speakon' cable connector and can put out 500 Watts in mono. You WILL have more than enough power now... right? Balanced and Unbalanced Line Outs: These can go right to the recording desk and you are able to turn on or off the cab simulator as necessary. So it's possible to actually feed the FOH desk AND your onstage speakers with your sound. There's also a ground lift to reduce hum in badly grounded environments or where there might be mains interference and also a -10 or +4 Output level selector for the line outs. USB Port: Now then - let's just take a breath and step back for one moment. The USB connector at this time does NOT allow for streaming of audio either in or out on this firmware version (currently 1.61). It might in the future? who knows? But at the moment the only use for the USB on this amp is for quote 'for service/maintenance' whatever that means - because there is no other information in the standard manual. Now it is possible that DV-Mark will be upgrading what this port can do but I really cannot tell you more at this time. I did get a hint from someone that a librarian type piece of software was in the works but to be honest I can't confirm that so do not hold your hopes up for one! MIDI Input and Output: I personally tested the MIDI with a G-Lab GSC-3 Floor pedal and found that the Multiamp is relatively easy to setup. In fact I had it working in about 5 minutes! ; that does not mean I controlled each and every last parameter that this amp has to offer - I did not. One reason was that the MIDI information in the owners manual was a little thin on the ground. However, once again, I had it working in no time and so will you. But it matters greatly when you are trying to set up a pro rig without those MIDI details; in fact it would be near impossible without lots of experimentation or a midi capture program. Let's get those codes ;-) and save a bucket of time then maybe we will be able to control the parameters in real time. Send and Return Loop: The send and return loop was nice; easily settable for parallel or series loop and its very easy to put it in a 'slot' anywhere in the audio chain. It can be switched with MIDI but I need more info not provided in the simple manual to do that. DV-Mark will have that sort of information available and I'm sure that many guys have already requested those MIDI codes. Well there certainly are lots of things I could talk about with the DV-Mark Multiamp. 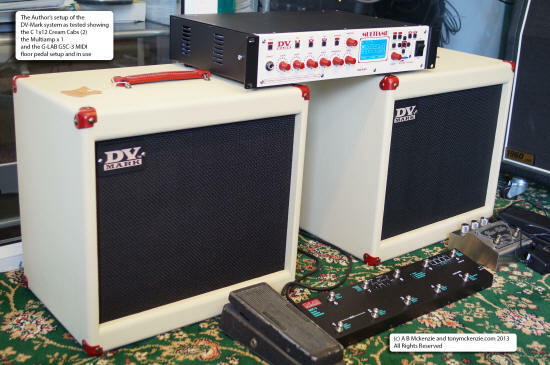 Other Amps and Cabs: Actually I DID buy two from the DV-Mark website. Yes that's right I BOUGHT them! They cost me here in sunny UK about £9.00 or say $13 equivalent. Now most of these simulator/emulator type of products have free amps and cabs right? Well it appears for the Multiamp that you have to buy them. Simply go to the site, buy them and download them, expand them and import the license.. it's ALMOST that simple. But there are a couple of caveats that I found. 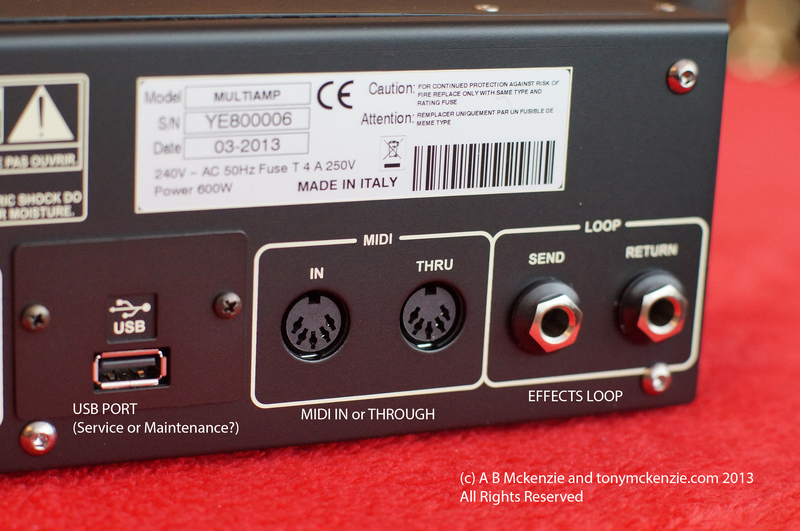 Firstly, you NEED your Multiamp serial number as these amps and cabs are individually licensed to the Multiamp. I have seen similar to this on Line 6 websites who have also been known to charge for other embellishments. Secondly, once you have expanded them you have to rename the file (each one) and place it on the SD card. Go to the System menu and load the license. There's only one issue... and that is, that you can not load more than one license at a time because they all have to be the same name on the SD card. Not the end of the earth, but somewhat simple is how I would describe that. The Firmware: I was using version 1.61 so that I could load in those licenses I just spoke about. The firmware loaded quite satisfactorily and relatively simply. BUT - I did feel that some of the operations of the Multiamp were in their early stages. For example, if I wanted to change a parameter (that I might expect to be on the parameter knob on the front of the amp) sometimes I had to use the arrow keys which was far less elegant than using the value knob. There are other similar anomalies in the Firmware but I assume that these will be ironed out in firmware updates pretty much as they are on other similar equipment these days. But I'm not going to write lots of simple boring stuff... lets find out more about the SOUNDS! I was impressed with the sounds of the Multiamp right off the bat; Roberto took me through some of them right on the stand at the Music Messe in Frankfurt; and he knows a thing or two about how to use this amp. Actually, it's so simple most guitarists would pick it up in no time at all. Although there are not that many amplifiers supplied in the unit the ones that are there are really great; and if you load up the pro's sounds (which are free) then this thing rocks! I loaded up Fabrizio Leo sounds and the amp changed from something that sounded great to something that you would NEVER think that this amp could achieve. And later at the show, I watched Andy James playing around with the Multiamp and he was really making it rock. I asked Andy what he thought about the Multiamp and his answer was simple - it's awesome! Now if it's good enough for Andy James and Fabrizio Leo (and a host of other guys from jazz to rock and back again then trust me on this these sounds will be good enough for you. I have video for the Andy James playing which will be either on this page, my video Page-HERE or indeed my YouTube channel at the end of the Review Video of the DV-Mark Amp. So the best way to hear it is with a Pro like Andy playing it. So I asked him to play for you and he did! Now many guys know I have looked at other products that compete with the DV-Mark Multiamp and sometimes those products have been good and other times they have been awful and even some company owners had little respect for customers. I think that many potential users will try and compare this Multiamp with either the Kemper Amp or the Axe-FX from Fractal Audio or even the Eleven Rack or something else similar. The problem is that firstly the Multiamp is NOT the same as a Kemper amp. Sure enough they are within reasonable price range of each other but the Kemper can 'profile' other amps better than anything else in the world right now as I write this review. It's so good that other companies have even tried to emulate the profiling technology. The Multiamp is not designed to be like the Kemper so if you want those features then buy the Kemper it's a great unit with great support but it also costs more money by the time you add the power amp. Other guys might conclude that the Multiamp is similar to an Axe-FX style of product. Unfortunately they would be wrong. 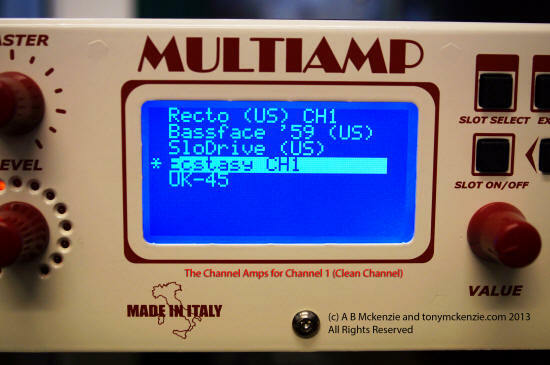 The Multiamp does not suffer from overly engineered software complexity that the user could take days or weeks to learn; and the hardware build quality and components in the Multiamp frankly is on a much higher level than what I have seen in both the Axe-FX or the Eleven Rack which I have owned and sold. While the Eleven Rack is cheaper and could be seen to 'do more' than the Multiamp, the sounds are far inferior in my opinion. The Axe-FX style costs (in Europe) near enough double that of the Multiamp and for a quality build (comparing the unit I bought against the Multiamp) the Multiamp wins hands down. The Axe-FX style does have more features (if you have the extended time to bother to learn it all); and I think most guys who buy quite highly complex equipment never really use all the features. But the Axe-FX style sounds are quite good; the question is of course are they twice the price without a power amp good? In my book they are not worth the difference in cost or complexity. I guess you pay your money and take your choice. I have loads of TUBE Amps; at last count it was about 15 or so and includes some of the finest products available in the world today in that technology. If I was to list every amp I have owned you could be shocked. So you could say that I have a but of experience with amps since I started to look at all this stuff back in 1968; and that's a long time to be checking this stuff out. In more recent times there has been a slow but progressive introduction of tube amp emulators/simulators and even tube amp 'Profilers' and some of these are quite good while others don't quite sound or feel right. And it's this aspect of sound that really cuts the mustard whether the unit is 'good or bad' as a replacement for a tube amp. The 'feel' of tube amps as you play is critically important and switching from a tube amp to a simulator can be a big disappointment in this area. The simulator often does not have the dynamics that a real tube amp offers. Tube amp technology has been around for a very long time, but today's tube amps are far and away from those early designs; open a top end amp up and you will see right away that indeed many have digital supporting technology right inside the circuitry for control of the amp or some today (read core blade or similar) even have fully digital effects built right in to the amp. The DV-Mark Multiamp really DOES cut the mustard where both quality, sounds and with those dynamics that you get with a tube amp there is no doubt about that. The Multiamp is light weight; it sure is, you can pick it up with one hand; and those cabs (even the 4x12) are so light but sound so cool that could be the thing that closes the deal for many especially if you're on the road a lot. The owner of the DV Brand is Marco De Virgiliis and he has developed world leading products for bass (ask your bass player if he is speaking to you right now LOL) and is now turning the screws slowly on the guitar amp market. With the already proven abilities of this company it's likely they will succeed as we move forward. I own a Kemper Rack unit without the power amp fitted because at the time I did not want to spend more money on the internal amp as I already had an external one. But now I can remove that Behringer amp from the Kemper's rack and fit the Multiamp with a really great reason to do so. You see, I could use the Multiamp for the Kemper as either an effects unit OR (and more importantly I think) use the Multiamp as the Power Amp for the Kemper if I want to use the Kemper live; but I have that option of changing back to the Multiamp in an instant! Now THAT'S a cool solution and I never had to buy another power amp to achieve it. In fact I can sell my Behringer or use it in the PA. Nice. It's very likely that the Multiamp will have a very flat response of it's power amp and that makes it really cool for Kemper users as well as Multiamp users; it's a sort of amp that can be many things to many people SIMPLY and without the fear of compromising quality for price. The Multiamp to me is a veritable bargain; now they just need to pin down those little niggles and hey presto - an amp that does what most guys really want - simple, great sounding, effective equipment that could so easily lead the pack. As always I like to list the good and not so good points about products I review. Remember these reviews are by someone that is probably just like you... I'm not a really great player, I buy everything but often my findings will be what you would yourself experience and that's the best way to find out about a product - right? 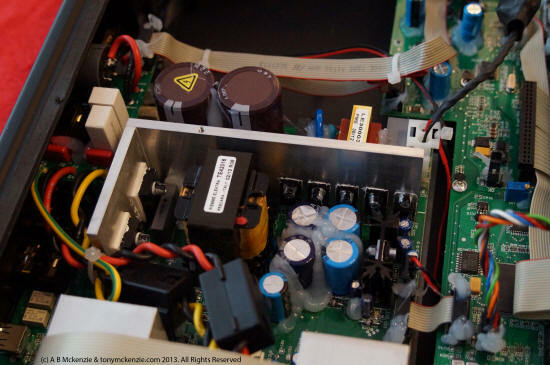 How certain amps were 'related' to certain channels... like clean amp to clean channel - nice. Maybe that's what DV-Mark intended but one thing is for sure - it works brilliantly! The 'feel' and the dynamics of the amp as you play. The Multiamp has great feel just like a great tube amp; many manufacturers say that their amp 'feels like a tube amp' but this in reality is often not quite the case; the Multiamp does feel like a tube amp. Period! The simplicity of the overall system - anyone could use it. The manual: The basic supplied manual was a little sparse for my liking. Its fine when you start out with the Multiamp, but you will then be asking questions about things that are not covered in the manual. I did check online but there was no update yet. 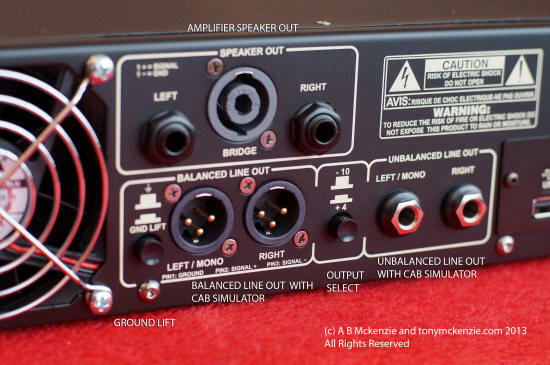 Buying a Multiamp: At first that was a little hard to achieve actually here in the UK. There are dealers, but many of them are trading on the style of 'if you want one we'll order one for you' and that is not really the best way to go. It becomes almost impossible to 'try' one out. They are on the internet but no one was offering a sale or return on one. You bought it - you owned it. Overall as a rating I give the DV-Mark Multiamp an 8 out of 10 and that's because of those niggling little things that I thought should be improved and no doubt over time they will be. That's a good rating overall nevertheless and don't assume that those niggles are really bad... they are not and would not stop me buying another one. It all comes back to that ease of use and the sounds from this little cream box; it's simple, easy to use, is extremely good value for money and not least sounds awesome. AND you don't need to buy a Power Amp! I bought my equipment from a Dealer and before you ask I bought all equipment that is in this review personally with money out of my pocket. But the Dealer got the kit for me quickly and are nice guys to deal with. What more could you ask? I may well have missed features and other stuff from this review - it's a long review and not easy to develop so my apologies for those. Now settle down and watch Andy James show you what he did with one at the Music Messe in Frankfurt 2013 style. Andy plays at the end of the video review I developed along with this written review and between the two you should get a really good idea what the DV-Mark Multiamp is really all about. There is also a video introduction on my channel right now and Roberto De Virgilio runs you through how easy the Multiamp is to use and demonstrates some simple sounds at the Music Messe. There's a snippet at the end of Andy James playing through the Multiamp and much more of that in the full review published as of 6th May 2013. I sincerely trust that this review helps you to decide about the DV-Mark Multiamp and whether it is for you and highlights some of the reasons to buy one as opposed to other similar equipment. © A B Mckenzie 1997-2019. All Rights Reserved.